Kenya has no fewer than six species (nine subspecies) of galago (Family Galagidae). Lolldaiga Hills Ranch supports one species, the Northern Lesser Galago Galago senegalensis. This medium-sized galago lives in woodland, bushland, and riverine forest were it feeds mostly on invertebrates and Acacia gum. 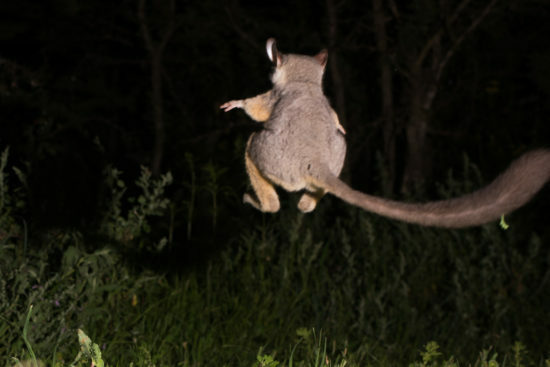 Galago senegalensis is arboreal, nocturnal, and produces a unique, loud, contact call…the ‘honk’ (= ‘woo’). Click here to listen to the vocal profile of G. senegalensis. Adult Kenya Lesser Galago Galago senegalensis braccatus, Tana River Primate National Reserve, north coast of Kenya. 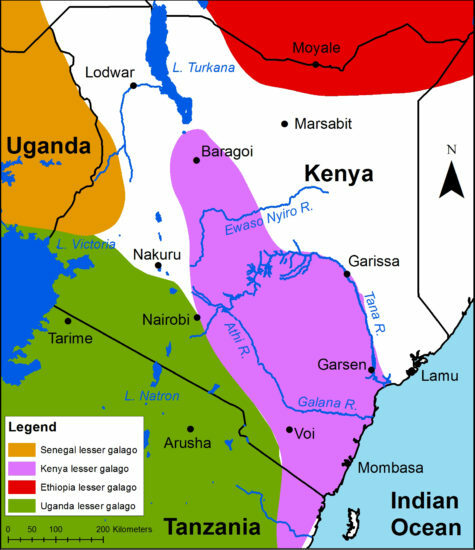 Distribution in Kenya of the four subspecies of Northern Lesser Galago Galago senegalensis. Map by Yvonne de Jong & Tom Butynski. The Acacia–Balanites woodlands and bushlands of Lolldaiga Hills Ranch support moderate densities of G. senegalensis. Here, this species occurs to at least 2150 m asl. This is the highest-known altitude for G. s. braccatus and the second highest altitude reported for this species (G. s. sotikae; Mau Forest, 2400 m asl; Butynski & De Jong 2016). Adult Kenya Lesser Galago Galago senegalensis braccatus, Mwea National Reserve, central Kenya. A dead (fresh) adult male G. s. braccatus found at 2150 m asl near the centre on the Ranch had average body measurements but a body weight of 330 g. This is 30 g more than the heaviest individual recorded for this species (mean = 206 g, n = 388; see table below). 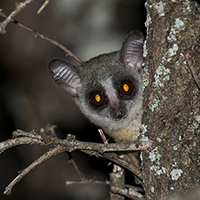 Body measurements of adult Northern Lesser Galago Galago senegalensis. Sexes are similar in the colour and pattern of the pelage. Mean weight of adult females is ca. 89% that of adult males (Nash et al. 2013). Juvenile Kenya Lesser Galago Galago senegalensis braccatus, Tumbili Estate, central Laikipia, Kenya. In 1847, Bergmann proposed a heat conservation mechanism for mammals living in cold climates. According to Bergmann, cold climates (either high latitudes or high altitudes) should harbour more larger-bodied birds and mammals, resulting in a decreased surface area-to-volume ratio, thereby, reducing heat loss. 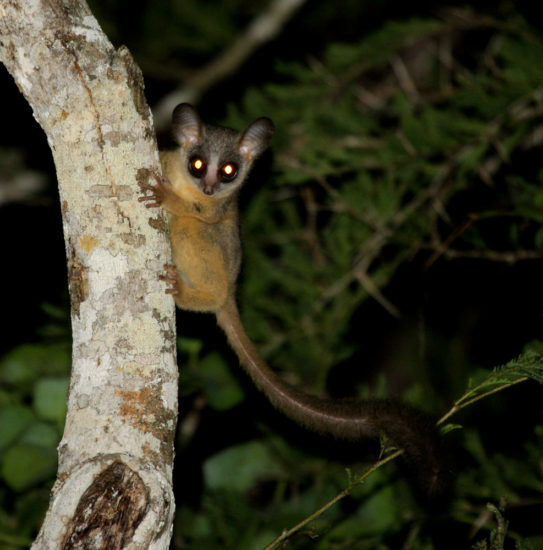 It is unknown if galagos of the tropics support ‘Bergmann’s Rule’, but the data to test this for G. senegalensis are probably available in the literature and among the hundreds of museum specimens from across the species’ range. Adult Kenya Lesser Galago Galago senegalensis braccatus, Mukima Ridge, central Laikipia, Kenya. Photograph by Paul Benson. 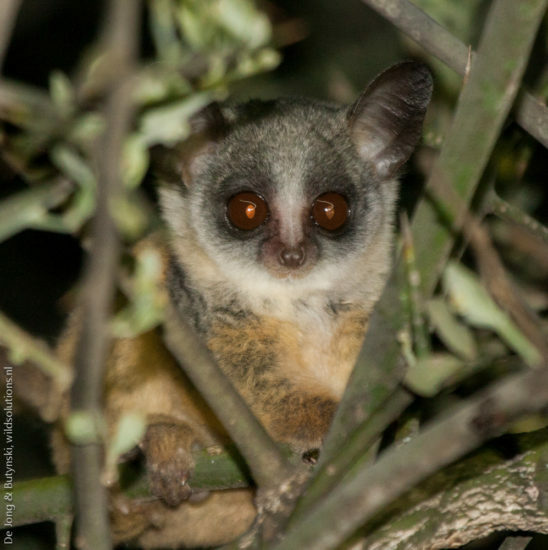 To see more photographs of G. senegalensis, click here to access the Galago PhotoMap. Bergmann, C. 1847. “Über die Verhältnisse der Wärmeökonomie der Thiere zu ihrer Grösse”. Göttinger Studien. 3 (1): 595–708. Butynski, T.M. & De Jong, Y. A. 2016. South Western Mau Forest Reserve, Game-proof Barrier Feasibility Study. Unpublished report to Rhino Ark Charitable Trust, Nanyuki, Kenya. 172 pp. Groves, C. P. 2001. Primate Taxonomy. Smithsonian Institution Press, Washington, DC. Grubb, P., Butynski, T. M., Oates, J. F ., Bearder, S. K., Disotell, T. R., Groves, C. P. & Struhsaker, T. T. 2003. 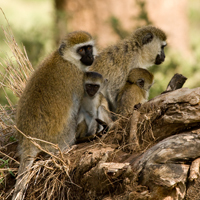 Assessment of the diversity of African primates. International Journal of Primatology 24: 1301-1357. Nash, L. T., Bearder, S. K. & Olsen, T. R. 1989. 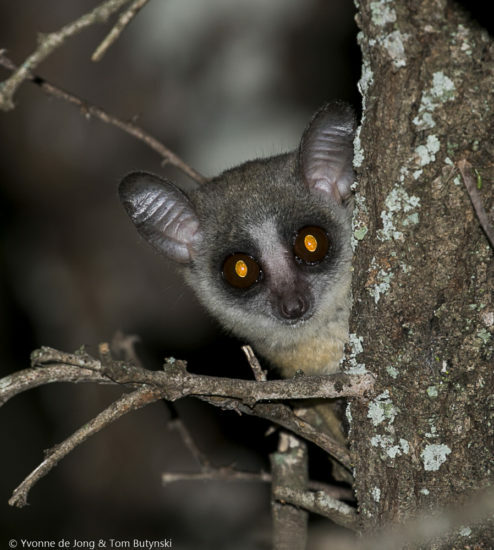 Synopsis of galago species characteristics. International Journal Primatology 10: 57-80. Nash, L. T., Zimmermann, E. & Butynski, T. M. 2013. Galago senegalensis Northern Lesser Galago. In: Mammals of Africa. Volume II Primates, Butynski, T. M., Kingdon, J. & Kalina, J, eds., pp. 425-429. Bloomsbury, London.